L-R: Councillor Ian Tuffin, Sir James Munby, Jane Elliot-Tocnic (Adult Safeguarding Manager, Plymouth City Council), Professor Patricia Livsey, Geoff Baines and Michael Mandelstam. 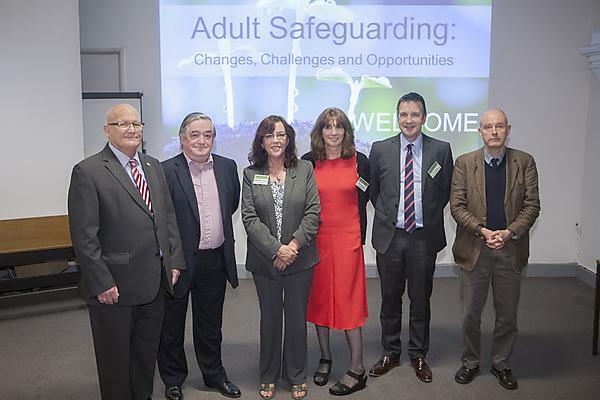 A conference on adult safeguarding in Plymouth has highlighted current issues practitioners and educators face in the field. Plymouth University, in partnership with Plymouth City Council and Plymouth Safeguarding Adults Board, hosted the event on 12 June, which saw Councillor Ian Tuffin, Cabinet Member for Health and Adult Social Care for Plymouth City Council, and Professor Patricia Livsey, Executive Dean of the Faculty of Health and Human Sciences at Plymouth University open the conference. Renowned speakers delivered presentations at the conference on areas including safeguarding adults from abuse and neglect under the Care Act, current guidance in regard to issues of self neglect, safeguarding in health settings, and the debate surrounding the right to intervene in adults’ lives, before opening up the floor to a Q&A session. “The safeguarding of vulnerable adults is one of our top priorities as a Council and we are very pleased to jointly host this new conference with both Plymouth University and the Plymouth Safeguarding Adults Board. Renowned author Michael Mandelstam speaking on protecting adults from abuse and neglect, in the context of the new Care Act.